Tell me, when you were a child learning the alphabet, wasn’t Q always for ‘queen’, and X was for ‘xylophone’? And what was Z for? Z was for ‘Zebra’, wasn’t it? Such was my conditioning as a child in suburban California, dreaming of animals in Africa for as long as my memories go back even though I was a half a world away. It came so close to the safari vehicle! Look – she’s preggers. In the Serengeti, a wonderland for safari holidays in Africa, you can see them all in just a few hours. They’re wild, free, and doing what animals do. You might catch them in a kill, running from point A to B, eating, swimming, or in the heat of the day – sleeping. There are giraffes taller and more intricately patterned than my imagination had previously allowed, and hippos that showed me that no, they’re not cuddly and cute, they’re ferocious and deadly. The leopards hang out in trees, oblivious of or maybe just ambivalent towards their fame, beauty, and popularity. There’s probably no way this hasn’t already crossed your mind, but yes Pumbaa from the Lion King is around as well, crawling around on his knees looking for grubs. That’s a boat load, no, more than a boat load, of animals! Indeed, the magic of the Serengeti is difficult to describe in words, which is why you see me reduced to referencing children’s movies and songs. The landscape of vast plains and a scattered outcropping of rocks (Kopjes ) here and there that was originally formed by volcanic activity is vast and diverse like few places on the planet. When looking out at the Serengeti it’s easy to see why the Maasai, who are the native inhabitants, know it as ‘Siringitu’ – the place where the land moves on forever. The Serengeti region spans over 30,000 square kilometers and encompasses the Serengeti National Park itself, the Ngorongoro Conservation Area, Maswa Game Reserve, the Loliondo, Grumeti and Ikorongo Controlled Areas, as well as the Maasai Mara National Reserve in Kenya. The part I visited was the Serengeti National Park and some of the surrounding conservation areas, sleeping just outside the park at the Simba Serengeti Lodge which is a tented lodge with a killer view. 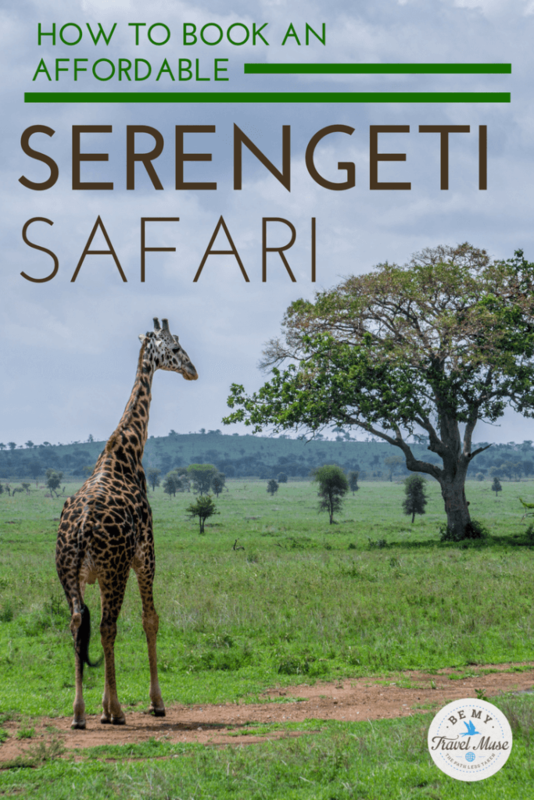 In the Serengeti, as with all of Tanzania, you can spend a metric ton of money on a safari, or you can go the extreme budget route taking a local bus and skirting the outsides without going in, or something in between. I opted for that something in between because I wasn’t about to go all the way to the Serengeti and not go in with a proper safari vehicle! While I’m a huge fan of doing things independently (I’m traveling through East Africa at the moment with a couple of others who are self-driving in their 4×4), we ditched the truck for this adventure for a few reasons: The roads are insanely bad in the Serengeti and we didn’t want to pop a tire, you really want a guide with you who knows how to spot animals, and the safari vehicles with the pop-up top are way better for viewing. Once we got there, we saw zero other self-drivers, thereby confirming we’d made the right choice. An overhead view of Lake Manyara during the bush flight. We saw some of the great migration from the air, too! Safari packages can cost tens of thousands of dollars per person on the high end, closer to several hundred dollars per day in the mid-range (which is what Simba is, and what I did), and can be more like a day tour departing from Arusha if you’re on a tight budget but still want to enter the park. There’s no bush camping in the Serengeti, as it’s a National Park, but there are campsites with amenities. There are a few clever ways that you can spend less money during your trip, such as staying on the outskirts of the Serengeti in the conservation areas for some of the trip. The park fees cost just over $70 per person per day at the time of this writing, but the animals don’t know what is in the park and what isn’t, and you’ll find just as many animals in the conservation areas, and far fewer people. We took the truck out and saw a family of elephants crossing a river and then the road right in front of us, escorting their two-month-old baby along the way. Many of the lodges, such as the Simba Serengeti Lodge, are located on the outskirts, so you can still stay in the vicinity of the park, see animals from your room (I saw a giraffe! ), and hang out in the pool in the hot afternoons, all enjoying the Serengeti without having to pay to be in it. In the conservation area, you can also get out of the vehicle (when it’s safe, of course), and do things like a bush breakfast. You can also book during the low season, which is right in the middle of the rainy season in April, or before the great migration begins in January and February. This is known as the green season in the Serengeti, when the dry and golden plains grasses turn more lush. You can get amazing lightning storms in the rainy season. This was taken at the end of February. As mentioned earlier in the post, there are several areas that make up the Serengeti and several other national parks nearby as well. The Ngorongoro Crater, for example, is famous for Black Rhino sightings and Lake Manyara National Park has beautiful flamingos. Tarangire National park also has plenty of wildlife, from monkeys to elephants and all kinds of species in between. Swimming in the pool just on the outskirts of the park, I saw a herd of male elephants walk by. Most of the time, when people come visit the Serengeti, they book safaris in these neighboring parks as well. Might as well if you’ve come all the way to Tanzania, right? All in all, I spent about 10 days in the Serengeti National Park, the crater, and the surrounding areas. Each day I saw something different and wonderful, including the big five: buffalo, lions, leopard, elephants, and rhinos. So if you’re going on a safari in the Serengeti and want to do it right with a mid-range budget, get a few of your friends, rent a big safari vehicle with a driver, and hop around a few of the lodges to see it all. I like Simba for this because the price is right, the food is really good and healthy, the service is great, the rooms are super clean and the beds are comfortable, they have outdoor showers (and I LOVE me an outdoor shower), and they all have pools and nice views. If you share the safari tented rooms, share the car, and enter the parks for one day each and spend the rest of the time on the outskirts, you’ll see plenty, spend less, and still be comfortable and happy with the experience. I definitely was! If you want to do it the way that I did, Simba Portfolio Lodges is offering a 15% discount for BMTM readers! Just mention this post when you email info@simbalodges.com for a discount off the rack rate for the trip that I did (and I’ve looked into it, guys, their lodges and drivers are priced right). *This post was brought to you in partnership with Simba Portfolio Lodges, who I worked with to bring you this discount and awesome Serengeti content. Thank you for this!! I’ve been trying to figure how to do Tanzania properly without handing over thousands of dollars to a tour company with mixed reviews. For those of us that won’t have a land cruiser waiting when we arrive, how would you recommended getting from a major airport to the Serengeti and Ngorongoro Crater? Are there reliable transportation companies around? You could fly into Arusha and get picked up there. If it’s not super expensive I’d probably do that. it’s a looooong bus ride from Dar es Salaam otherwise. Doable but not much fun. Awesome article. Going on a safari is totally on my bucket list 🙂 what made you decide to do a safari in Tanzania? There seems to be so many amazing places to choose from. I’ve gone on safaris in Namibia, Botswana, and Zambia as well and those were all wonderful, but the Serengeti is so famous. They all have different things that you can see, so for me this was a bucket list item. Actually you can camp in the Serengeti – they have designated camp areas, with bathrooms and little buildings for cooking and eating. We went with “It started in Africa” which is very affordable and comes highly recommended. The guide and cook were absolutely smashing and i would go with them again in a heart beat. Also very competitive on price. Good to know! I meant you can’t bush camp, so you can’t go in and camp for free, but I’m sure there are all kinds of options once you’re in the park and in a designated area. You still needed a guide and cook. This was very helpful, and is definitely something I’ve always wanted to do! Including the other places you’ve done, do you have a favorite? Is it possible to do this kind of trip in those countries? How much of this trip would one need to set up for themselves vs Simba Lodges? And how many days would you recommend? I really liked the Serengeti and Chobe in Botswana the best, however I did not see cats or rhinos in Chobe. That’s on a river rather than in a vehicle so it’s different. I did 9 days but one week would totally work too if that’s what you have to work with, or even a few days less. Honestly having a vehicle is a must so I’d start there. I’d also book it all together, for ease and probably price as well. I’m a fan of doing things as independently as possible but Africa is just different with how difficult that can be. Also, how was the heat, since you were in a tent, which I’m assuming wasn’t air conditioned? The temperature for most of my time in Tanzania was comfortable during the day and they actually provide a heated water bottle at night because it gets a little bit chilly, but it was still tank top weather for me. This was super helpful! My husband and I are planning to go in January. However, its really hard to plan such a big trip without knowing the area. You mention “grabbing a group” to share the guide and the truck but like I mention we are traveling alone. Is it common to meet people there, Perhaps at the Simba Lodge looking to share a guide? You could ask Simba lodge when you book if it’s possible to join another group. I wouldn’t plan on finding people there. How to you go about finding the drivers to hire? Is there a site or place to find them? I went with Perfect Africa for the Ngorongoro Crater and I really liked them, and Simba for the Serengeti. Hello, thank you for this! I am planning a trip to Tanzania solo, and I love the idea of doing this how you did it. Would you recommend first booking accommodations at the respective lodges, then finding an operator? Do the lodges have any relationships with operators? I, too, would be coming solo but interested to find a group – do the lodges or operators help facilitate groups coming together? Thank you again! Your blog is wonderful for women traveling solo! Thank you for this absolutely wonderful blog post ! Pinned it already and going to look it up whenever I plan my trip to Tanzania. There are “local busses” from which place to which place? Where you you rent a 4WD without driver? Company name? Did you rent a guide who “knows how to spot animals”? If yes, what operator? Hi Kristin. Love your site and we just booked at Simba on your recommendation :). I wanted to ask any tips you might have on how long customs takes in Dar Es Salaam – we need to catch a FastJet to Mwanza after landing – and the best place to get a SIM card. I saw you mentioned Vodacom, but where to buy? Also, we could use recommendations about how to get to the Serengeti from Mwanza. Thanks!! There’s a tiny little stand outside the airport where you can buy a SIM. Ask around and people will point you in the right direction. It takes a bit of time to get the visa in your passport, and that will all depend on how many staff are working, how many people just landed, and if their systems are up and running. It’s a tough question to answer. I’d leave a generous time buffer if you can. I was in a private car my friends owned to travel around but you can also as Simba to organize transport for you! Hi Kristin, I’m a bit confused. So basically you didn’t use a tour operator and stayed in the Serengeti Simba Lodge the entire time? How did you get to the lodge? I would be landing in Kilimanjoro Airport from my international flight. Also, how did you do game drives? Who did you book that with? Thanks. Simba provides all of the game drives and transport as well. Hey! How much all up did it cost you for the 10 days? Did you see the migration? I’m trying to get pricing from Simba based on your recommendation here as it’s not on their website. To be totally transparent I didn’t pay for it. I wasn’t there in migration season. Hi Kristin, could you give some recommendations of reliable local companies i could book my safari with? (Which i can also find on tripadvisor) safaris are so expensive, until now i did not find a good one below 2500dollar for a 8day safari. Could you send me some concrete recommendations in order i can make it affordable? (I have already read above comments). I only did the one mentioned in this post so I can’t really recommend any others. You can always choose to camp instead and go with a G Adventures type of tour. Was the accommodations for Simba and the guide prebooked or did you book everything once you were already in Africa?